Undergraduate physics and chemistry students from throughout the country have come to CHESS to conduct cutting-edge research this summer. In addition to working with staff scientists to understand complex phenomena and contribute to the growing body of knowledge surrounding x-ray science, these students are working with outreach staff to deliver educational programming to area youth. The young age of these researchers, coupled with their enthusiasm for and familiarity with scientific inquiry, makes them exceptional promoters of their field. Michelle Kortenaar, Director of Education of the Sciencenter, dry runs an activity exploring iridescence and light waves with a group of summer research students and an 8-year old volunteer. Summer students spend approximately four hours working with outreach staff, developing, discussing and dry-running activities for various audiences.They spend another half-day in and around the Ithaca area conducting demonstrations, sharing hands-on science experiments, and facilitating make-and-take engineering projects. Feedback from the community is overwhelmingly positive, "The depth and breath of the demonstrations went way beyond what a science teacher in a regular classroom could ever do. At the risk of sounding like a broken record, it was just so gratifying to see so many kids so excited about science!" said Dryden, NY parent Sandra Busby after a visit by the Xraise team and undergraduate ambassadors. 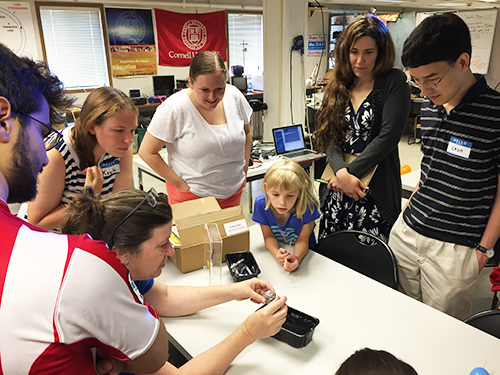 Venues for this summer's outreach included Dryden Elementary School and the Greater Ithaca Activities Center in collaboration with the Physics Bus, the eXploration station in collaboration with Cornell's Cooperative Extension 4-H Program, and the Sciencenter.